Defenders in field hockey often feel under served by the stick manufacturing community, though they make up at least a 1/3 of the players on the pitch. Normal requirements from defenders include a sturdy hockey stick to make strong tackles, good hitting power to clear the ball up field and a high bow to give a straighter low section of the stick. With the need of defenders in mind, here are the Top 5 Best Hockey stick for defenders in the 2016 / 2017 season with have a mid / highbow and all the other features a defender desires. Kookaburra Team Midas hockey stick is one of Kookaburra’s top of the range sticks. Used by many of the top defenders around the world. The high carbon content and 4 core construction help defenders hit hard. It’s light enough to throw around while being very sturdy and defenders will benefit from a high bow at 380mm up from the head, making the lower part of this hockey stick relatively straight. Although the Team Midas is top of the range, you can buy Kookaburra Team Midas sticks at a great price. Try to buy Team Midas online from amazon for the best online deal we can find. Osaka hockey’s mid-bow shape hockey sticks might just be what a defender needs. The higher bow 300mm up from the head makes the lower part of the stick straight, and the carbon wrap around the shaft of these sticks makes them stronger and punchy. With slightly higher carbon content (and higher price) the Osaka mid-bow sticks are on sale online in the top of the range Pro, 80% carbon 4-Series and 70% carbon 3-Series models. 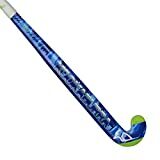 Despite their website saying otherwise, the Adidas V24 hockey stick is the supremo mega-brand’s highest bow hockey stick with a bow position at 300mm up from the head. The V24 is a powerhouse, with the Adidas DUAL rod construction system offering excellent power for defenders. Adidas hockey sticks have one of the best balance points of all sticks and the V24 will allow defenders to control the ball, and the attackers all day! You can buy adidas V24 hockey stick online directly from Adidas and if you can stretch the extra money, try to get a Carbon model OR it’s available in Compo 1 which is slightly less carbon content but still a powerful stick. Mazon sticks are solid as a rock, this gives defenders great power clearing the line and also making tough solid tackles. Mazon Black Magic v5 (and it’s slightly newer v6 model, only available in some locations at time of writing) feature a great mid-bow shape 300mm up, for the straighter lower sections most defenders desire. If you don’t want to spend that much on a stick, the Mazon Fusion 500 has the same shape bow, just a little less carbon. Buy Mazon Black Magic v5 online at amazon by clicking that link. Midbow sticks from Grays are few and far between, the GR8000 though is one hell of a higher bow stick and great for defenders. One thing you always get from a good Grays hockey stick for defenders is a strong feel, the GR8000 adds to that by being light enough for nimbly moving around when channelling players. This high carbon content stick is a little pricey, you could move to the Grays GX5000 midbow if you want to save some cash, which is still a great hockey stick. These are just 5 of the best hockey sticks for defenders. If you follow the rule that defenders benefit more from the higher bow position you will find more hockey sticks from other brands, Gryphon’s classic curve is another for example.